The University of Montevallo has partnered with Credentials Inc. to process all electronic transcript requests. The PDF transcript produced using the TranscriptsPlus service contains the same information as the printed official transcript and can be certified as unaltered during the upload and delivery process. If you are uncomfortable placing an order over the Internet, you may contact Credentials Inc. at 847-716-3005 to place your transcript request. There is an additional operator surcharge for orders placed by phone. Login to your Banner Self-Service account. Click Student, then Student Records, then Order Official Transcript. Paper and/or electronic transcripts can be ordered 24/7 through TranscriptsPlus. Paper transcripts are printed and mailed Monday through Friday, 8:00 a.m. to 4:00 p.m. (CST/CDT). Most transcripts are sent within 24 business hours of receiving the request. Currently enrolled students are not charged a transcript fee. The Credentials Inc. Customer Service Department can be reached at 847-716-3005, and is available between the hours of 7:00 a.m. and 8:00 p.m. (CST/CDT), Monday through Thursday, and between 7:00 a.m. and 6:00 pm, on Fridays. If you require assistance or have questions about the TranscriptsPlus service, please refer to the contact information above. To check the status of your transcript request(s), click here. Click on Student, Student Records, Request Unofficial Transcript only. Unofficial transcripts are processed Monday through Friday, 8:00 a.m. to 4:00 p.m. (CST/CDT). You will be notified when the unofficial transcript is ready for pick up. If you require assistance or are having problems with your account, please contact the Registrar’s Office at 205-665-6040. The Registrar’s Office will not release any transcript if you have a financial obligation to the University. It is your responsibility to notify the Registrar’s Office at 205-665-6040 or registrar@montevallo.edu after clearing your financial obligation to have your transcript released. The University of Montevallo has retained Credentials Inc. to accept transcript orders over the Internet. If you are uncomfortable placing an order over the Internet, you may contact Credentials Inc. at 847-716-3005 to place your transcript request. There is an additional operator surcharge for orders placed by phone. To order an official transcript(s) online, click here. Note: As alumni or a previous student of UM, you are NOT required to enter your student ID number when ordering a transcript. Simply leave this field blank if you do not know your student ID number. Official transcripts can be ordered 24/7 through TranscriptsPlus and are $10.00 per copy. Credentials Inc. accepts payment through Visa, MasterCard, American Express, and Discover. If you attended UM prior to August 1987, your official academic transcript cannot be sent electronically. Hours of Operation: 7:00 a.m. to 8:00 p.m. (CST/CDT), Monday through Thursday; 7:00 a.m. to 6:00 p.m., on Friday. To check the status of you transcript request(s), click here. The Registrar’s Office will not release an official transcript if you have a financial obligation to the University. 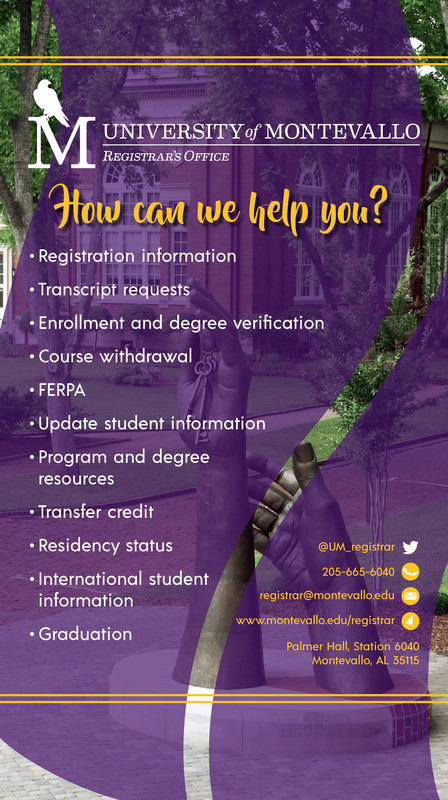 It is your responsibility to notify the Registrar’s Office at 205-665-6040 or registrar@montevallo.edu after clearing your financial obligation to have your transcript released.